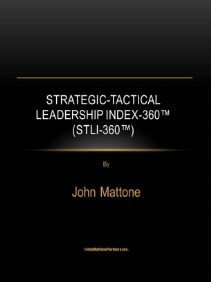 Click here request a complimentary sample PDF version of John Mattone’s proprietary Strategic-Tactical Leadership Index-360™ (STLI-360). If you want to have the STLI-360 administered, this includes us handling all the details to ensure your stakeholders are properly notified about their participation in your 360-assessment and provides confidential STLI-360 access information so they can provide their anonymous feedback. In addition, we will prepare a custom 40-page STLI-360 Report: (a) comparing your self-assessment ratings to your stakeholder’s (manager, peers, direct reports, indirect reports, and other) ratings; (b) detailing your highest and lowest rated competencies and behaviors; (c) highlighting your most significant “blind spots” and “surprise strengths”; and (d) capturing “open-ended” comments from your stakeholders about your leadership strengths and development needs. 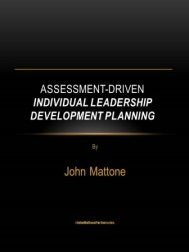 If you want John Mattone to personally debrief your STLI-360 Report, he schedules 2-hour debriefs which can be accomplished in-person or virtually. Please indicate in your request if you are interested in: (1) having the STLI-360 administered (individually or you have a potential group administration project) and (2) if you would like to schedule John to debrief your STLI-360 Report. Click here to request your complimentary Cultural Transformation Readiness Assessment-40 (CTRA-40).This assessment measures your organization’s readiness to successfully change and transform its’ culture based on John’s 6 Steps of Culture Transformation. There are 40 items across 6 Cultural Change Readiness Predictors (i.e., The imperative to transform; leadership; creating a compelling future; changing mindsets/changing behavior; pushing “talent levers”; and measure & course correct). 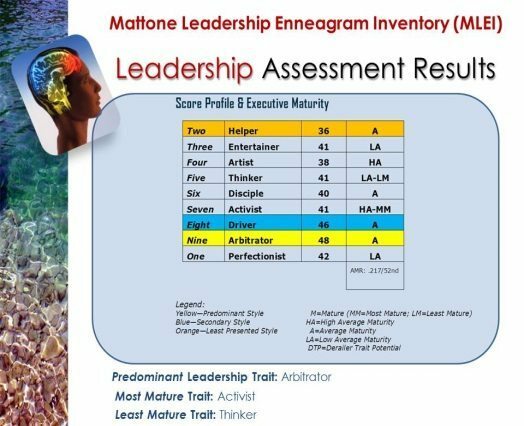 This assessment is typically used by the senior executive team to isolate their organization’s readiness strengths and gaps prior to launching a change or transformation initiative. Ideally, the CTRA-40 is implemented after a deeper and broader cultural assessment has been completed (see below), which isolates the current culture strengths and gaps that impact overall readiness to change or transform. Click here to request more information and pricing options on The 5 Cultures of Culture Assessment (5CCA). This 40 item assessment measures the strength and health of your overall current culture, based on the 5 elements that define culture: Capability Culture; Commitment Culture; Alignment Culture; Individual Performance Culture; and Team Performance Culture. 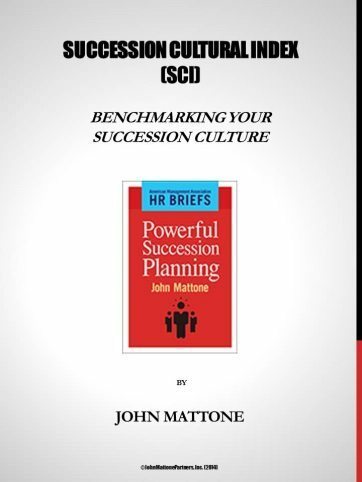 Click here to request your complimentary Succession Cultural Index (SCI) that will help you and your organization benchmark the effectiveness of your current succession processes and tools. 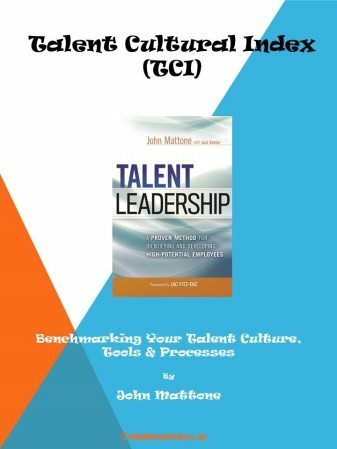 Click here to request your complimentary Talent Cultural Index (TLI) that will help you and your organization benchmark the effectiveness of your talent culture processes and tools. Click here to request your complimentary Assessment-Driven Individual Leadership Development Plan (ILDP) Tool that will help you clearly identify your (1) indisputable strengths; (2) indisputable development needs; (3)surprise strengths; and (4) surprise development needs, so you can build and implement a targeted leadership development plan. 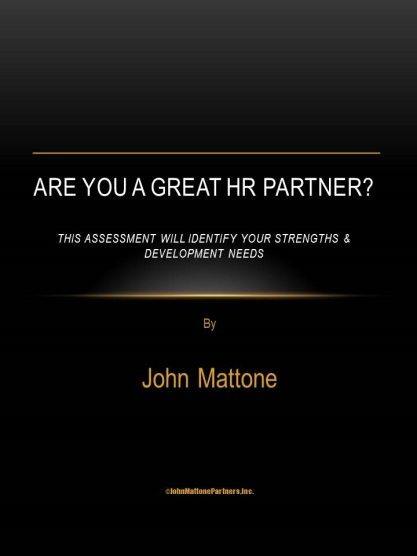 Click here to request your complimentary HR Partner Assessment that will help you determine your strengths and development needs as an HR Partner.